All over the world cultures have developed their own measurement systems. We will explore some of the major historical systems (Egyptian, Roman, Babylonian, and others). We will also explore some more recent imperial systems, especially the British (and US) measurements. Finally, we will follow the development of the metric system after the French Revolution in 1789, and learn of its development through the cgs (or CGS) system and the MKS system to the current International System of Units (SI) which is used throughout the world (except in the USA and its former dependencies). I trust that you will find it to be a fascinating journey. Despite our 'modernity,' we continue to use the ancient Babylonian sexaguesimal (base 60) counting system to measure angles and time. Understanding this system is therefore important. It is even more important because it helps us better understand our modern decimal system of numbers. In this video I demonstrate how to add using Babylonian (cuneiform) numerals. I then show how to add our modern measures of angles and time using the same system (on a white board). You will also learn a little about John Wallis, a contemporary of Sir Isaac Newton, who generalised the symbols that we use to keep track of what each column represents (i.e. degrees, minutes and seconds)! John Wallis was not the first, however. For many years, Arabic and Persian scholars had been making astronomical calculations using sexaguesimal notation. In order to understand how they did this we need to understand place value in our current decimal system. When we write our decimals numbers, we are really writing a list of fractions with a decimal point as a marker. Hence 6.438 means 6 + 4/10 + 3/100 + 8/1000. In an almost identical way, Arabic and Persian scholars (such as al-Kashi, c.1380-1429) wrote their sexaguesimal fractions in columns. For them the number 3 6 14 43 29 would mean 3 + 6/60 + 14/3600 + 43/216000 + 29/12960000 (where 60×60 = 3600, 60×60×60 = 216000 and 60×60×60×60 = 12960000). It is astounding that the Babylonians coped so well with this system! In order for them to keep track of which number was in which column, they used to be written in tables with labels written at the head of each column. 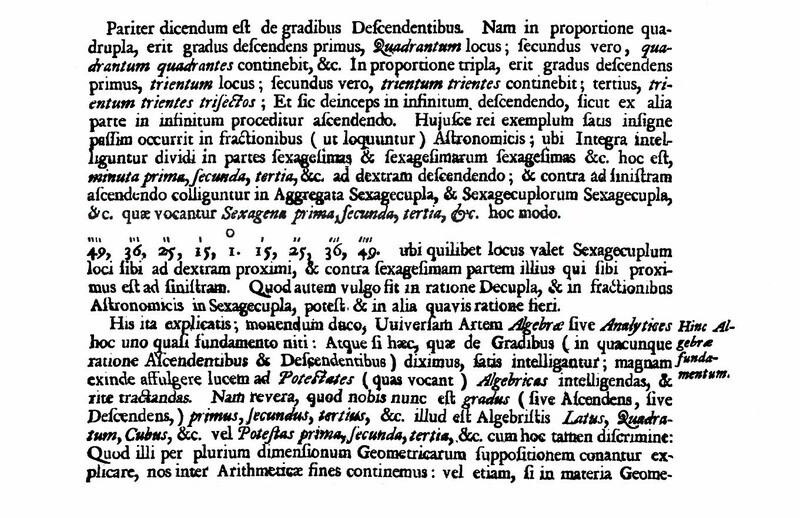 By the time this system was being translated into Latin for Europeans to read, the sexaguesimal parts were labelled primae minutiae, secundae minutiae, tertiae minutiae, etc. and these Latin terms meant (quite literally), first little bits, second little bits, third little bits, etc. These subdivisions were denoted by writing Roman numerals as superscripts. I am not quite sure how it happened, but the second and third and fourth parts were called just that ... seconds, thirds and fourths. 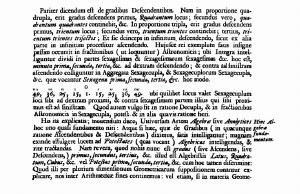 The primes, however, took their name from the other term in primae minutiae, and came to be known as minutes (from minutiae). Hence, now that we have dispensed with thirds and fourths, and so on, we now speak of sexaguesimal fractions in terms of minutes and seconds (rather than primes and seconds)! You will recognise that we still divide our hours (time) and degrees (angles) in this way. You can see that he used the older Roman notation for the number four ... just four strokes (IIII) instead of IV. The same notation was used to the left to denote the degrees as well. Most of the world now uses the metric measurement system. This is only a recent historical development. Not many years ago there were scores of measurement systems the world over and this led to massive complications for trade. The British/US Imperial system for measuring lengths began its development during the Greek and Roman empires and was further refined and expanded during the Saxon and Norman eras and the Middle Ages and Enlightenment. I share (briefly) how the major units came to be: inch, foot, yard, chain, furlong and mile. I then explain how two distances could be added using this system of measurement (although it would have been exceedingly rare to use all the units as I have done). In this way we can further see how place value and the concept of base arithmetic governs our understanding of how to 'bundle' figures together. As well as learning some mathematics, you will see my Gunter's Chain and learn how it was connected to the early days of cricket. The photograph above (of a Gunther's Chain) was provided by the kind folk at the South Australian History Hub. This particular chain is believed to have been used by Isaac Guley in surveying the City of Adelaide with Colonel Light. 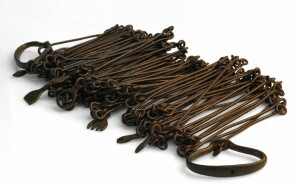 You will note the metal tags that indicate the location of ten, twenty, thirty and forty links from each end (there are 100 links in a chain). You will also learn about Roman (and other) soldiers creating maps while marching between towns, discover how bolts of cloth were measured out for customers keen to do some sewing, and learn something about Saxon farming techniques! The British/US Imperial system for measuring weights began its development during the time of the Roman empire and was further refined and expanded especially during the Norman era (around 1300 AD), during the reign of Elizabeth I, and during the 1800s. I share (briefly) how the major units came to be: pound, ounce, stone, hundredweight and ton. I then explain how two weights could be added using this system of measurement (although it would have been exceedingly rare to use all the units as I have done). In this way we can further see how place value and the concept of base arithmetic governs our understanding of how to 'bundle' figures together. As well as learning some mathematics, you will learn how stones were used for centuries for weighing wool (in particular). You will also learn how the Avoirdupois System was modified by the British to accommodate the stone and how this accommodation led to some unusual measures! Finally, I will show you the key difference between the American and British Imperial Systems for weights. I hope you enjoy the video.